After leaving The Daily Show, Jon Stewart has kept a relatively low profile regarding mainstream media and entertainment. However, this is mainly because he’s been busy creating an sanctuary for abandoned farm animals. 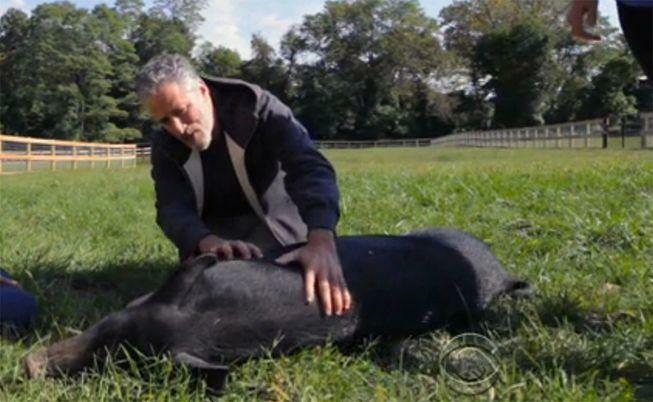 50 miles outside of New York City, Stewart and his wife, Tracey, have converted their recently bought farm into an animal sanctuary. According to CBS This Morning, over a dozen animals are living on the Stewart’s New Jersey farm, and if the video report is any accurate, they are living in luxury. Stewart and his wife, who is an author and an avid animal activist, announced their partnering with Farm Sanctuary at the organizations 2015 Gala at the Plaza Hotel in New York City. The announcement was made during the couple’s acceptance speech for the Gift of Life Award, which was rewarded to them for their efforts in promoting compassion for farm animals. Farm Sanctuary is a non-profit organization that was founded in 1986, and was America’s first farm animal advocacy group. They have been working with the Stewart family to open a new branch of the organization onto their 12-acre farm. So, although Jon Stewart may not be keeping busy in the comedy department, he is still bringing joy to the lives of many individuals, even though not all of them are human. For more information on stories about animal welfare, click here. Read Next: This Campfire Charges Your Phone, Produces Zero Smoke And Is Completely Eco-Friendly!